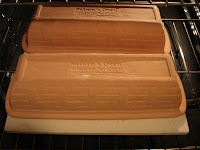 I hope my regular readers will forgive me yet another post about bread and baking paraphernalia. Jim Lahey's bread recipe, the subject of an earlier post, requires a floured, non-terrycloth dish towel for the dough to proof in. Since I have been making bread about two times a week, I decided (for the sake of my kitchen towels) that it was time to make some heavier duty canvas sheets, to be used solely for proofing dough. I bought 3/4 of a yard of 100% cotton canvas. 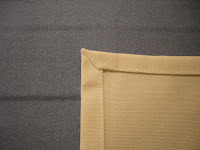 First, I pressed the fabric and evened up all of the edges. 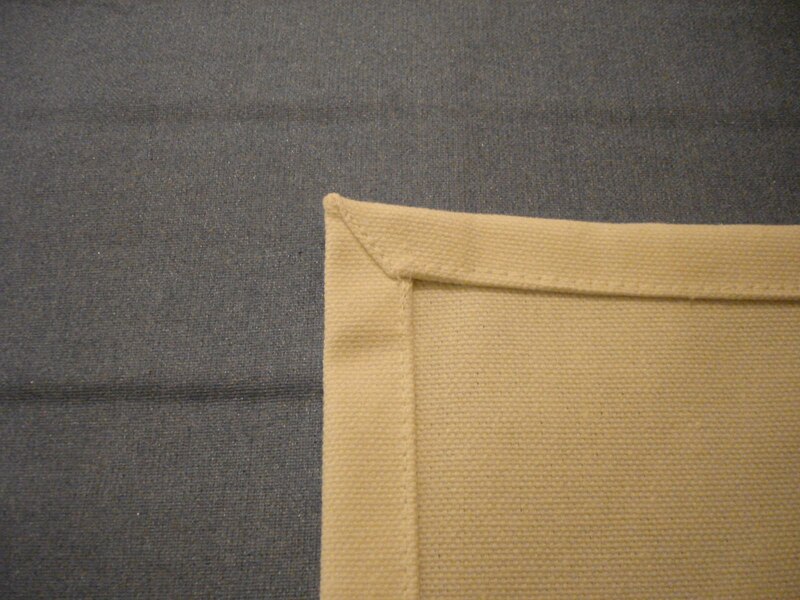 I cut the sheet in half, width-wise, making two slightly rectangular pieces of cloth. With the first piece, I cut a 1" square from each corner. 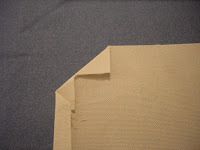 Then I folded the edges of the squares down to form right triangles (see photo). Once all of the triangles had been created (eight total, two at each corner), I folded the entire length of each side down 1/2" and pressed these folds. Once all four edges were folded down 1/2," I folded the edges down another 1/2." This creates mitered corners and hides all of the raw edges. Essentially, you are making a giant canvas dinner napkin. I stitched down all of the edges and corners. Once I had completed the second sheet exactly like the first, I washed them both and pressed them again. I baked bread today using the no-knead method. 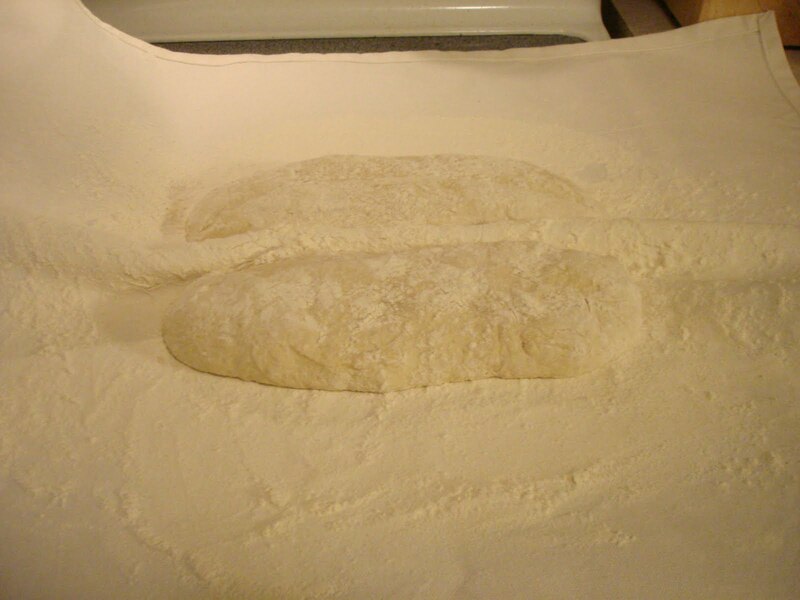 When the dough had gone through a first rise overnight, I divided it and placed each piece on my well-floured canvas sheet to rise again. Also, after I realized how obsessed I was becoming with his recipe, I followed Lahey's lead and purchased several Romertopf bakers. Essentially, they are pieces of unglazed terra cotta (lead-free and cadmium-free, of course) that help food retain moisture as it cooks. 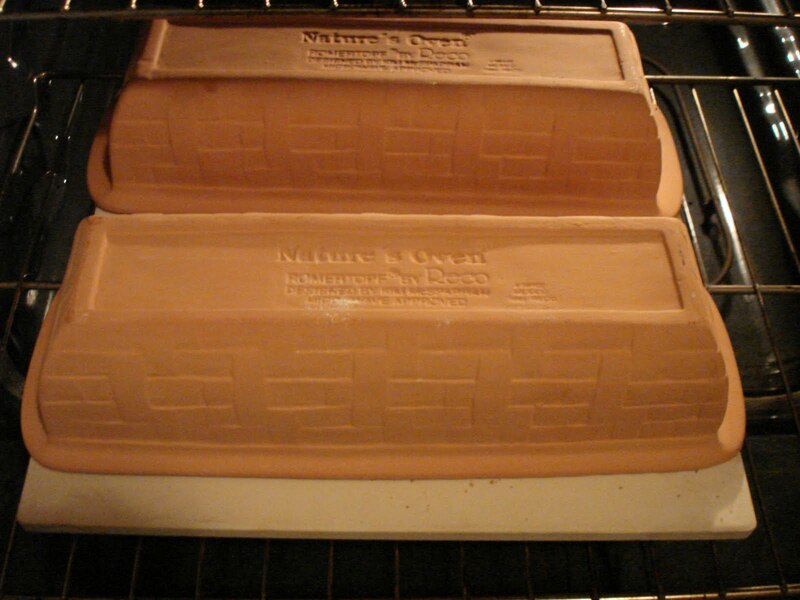 Like the cast iron dutch oven in the basic recipe, the terra cotta bakers help mimic a steam-injected professional oven. The bakers are soaked in water for 10 minutes before they are heated. Because they are sensitive to dramatic changes in temperature, the bakers are placed in a cold oven and allowed to heat with it. 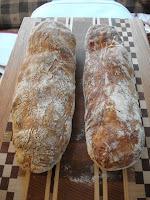 Once my dough had risen (the canvas sheet worked like a charm), I baked two baguettes using the Romertopf French/Italian bread bakers on a pizza stone base. I plan on using my canvas sheets whenever I am proofing dough. This method could also be used to make table linens, such as napkins and tablecloths. I hope you will consider purchasing fabric and tailoring your own linens for your kitchen and dining needs. Be creative and enjoy! Thanks for the instructions on how to make proofing sheets. I went online to buy a few, and Hey! There were our instructions. So I dusted off my sewing machine and got started. They work great!